Best Free Country Music in the U.S.A. Since 1925 ! We provide free weekly summer, old time Country Music entertainment for young and old alike and we are older than Nashville! We used to do this three nights a week for our senior citizens and younger fans but Country Music is much more expensive than it used to be. Keeping the park going has reduced our playlist to one night per week and soon it may be gone completely for the first time since the civil war. Let me tell you a little bit about this unique of old Americana trying to survive for the next generation. Nestled at the foothills of the Appalachian Blue Mountains of Eastern Pennsylvania, lies the small town of Alburtis. 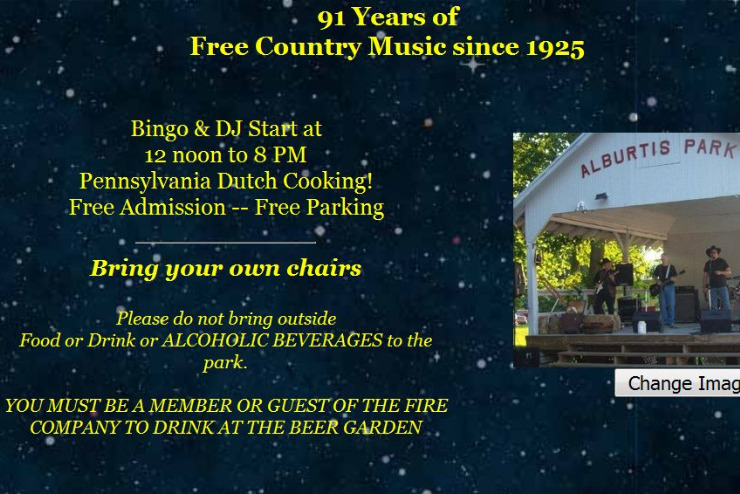 In this town is a park and bandshell, owned and operated by the Alburtis Fire Co #1 (volunteer), that has been the regular host of Country Music Shows since 1925 – That’s BINGO, FREE country music and home cooking for those who don’t know us. Sometime after the Civil War a group of veterans and other citizens began to play music in Alburtis. They eventually constructed a building and played inside on a stage for the residents. They called themselves the ‘Alburtis Band’. In 1925 they began playing in their ‘new’ bandshell and have continued through World Wars, times of prosperity and even through the depression the music continued. Alburtis Park has kept its tradition going through Big Band, Rock, Disco and Pop Music Fads ... some call our style “Old School Country”. The heart music of America, the kind we used to see at Nashville. However, modern-day Country Music is big business and Alburtis Park doesn’t see the ‘big’ names in Country anymore … we can’t afford them. Historic Alburtis Park is a great place to start or advance your career and today local and regional musicians are our main stay. We draw in fans from across New Jersey and Eastern Pennsylvania and many bands have started here over the years only to outgrow our ‘classic country’ and go on to greater careers. Today our visitors continue to come each summer weekend but many of the older music lovers are passing on. There is real danger of having to close the Park after being in business for 93 years. We would like to put Alburtis Park back on the map. So, we are reaching out to our Country Music Family to help us continue our programs and expose our activities to a larger audience. We are asking for your help. Are you willing to donate to our fund or provide a full performance or even a cameo appearance in an up-close audience like it was in days gone by? We have on-site professional sound equipment, amps and drums for your use. Could you donate promotional items such as T-shirts, DVDs, etc. for Benefit Events. Cash donations are rarely refused …. The Grand Ole Opry and Alburtis Park have things in common, both started in 1925 and support Country Music. Help keep the Alburtis Park going so the next generations can enjoy the Free, Old School Country Music experience.